What is it about some circus clowns that can be so unnervingly scary? Something about those eyes, maybe? Whatever it is, Yggdrasil software has successfully bottled it and infused it into the Wicked Circus slot. Our review delves inside its dark world to check out a game with some interesting features, including the 6,000 coin Jokerizer mode jackpot. 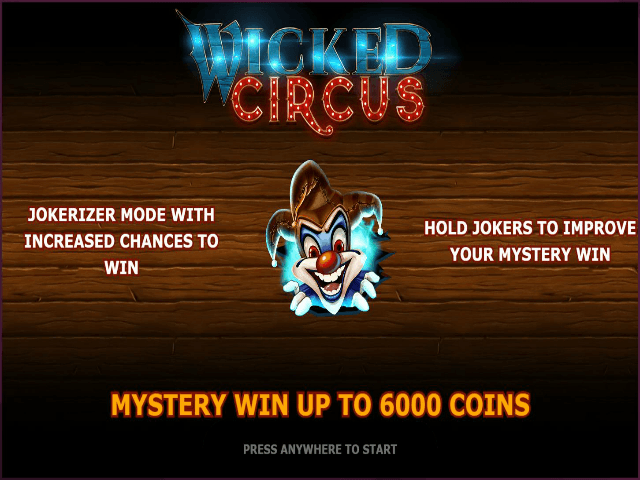 Play Wicked Circus Slot Demo for Free! Play Wicked Circus for Real Money! From the moment you launch the Wicked Circus online slot and hear the creepy music, you'll feel immersed in its storyline. 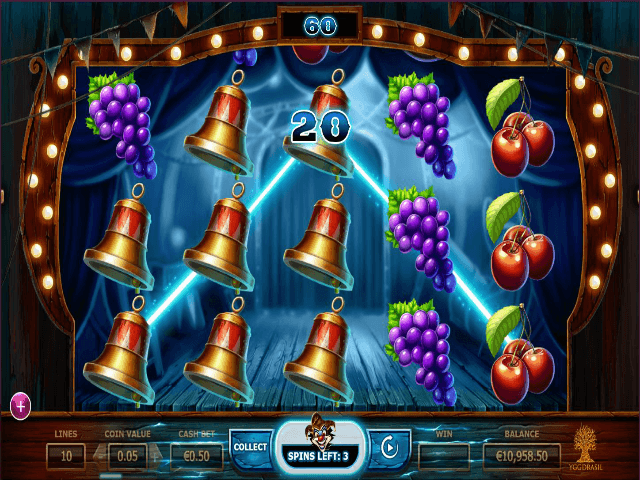 The fruit machine's slotscape is a classic circus caravan, with a 3D feeling as you peer through the window and watch the reel symbols cascade down. The background is suitably dark and the icons have a traditional fruity feeling with the base game featuring cherries, grapes, lemons, 7-symbol and bells, plus the notorious circus dart (or should that be knife?) board. Factor in some spooky cackles of laughter and the slick graphics we've come to expect from Yggdrasil, and it's full of fun. When it comes to pay-outs, the Wicked Circus slot machine rewards you both ways on its ten paylines, with plenty of base-game action virtue of a 96.3% return to player level. Add on the unusual Jokerizer mode with mystery prizes and this is a circus certainly worth buying a ticket for. 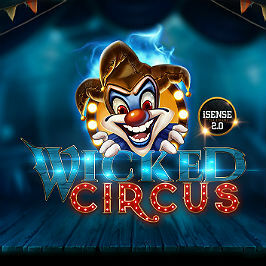 The Wicked Circus online slot can be spun from 0.01 to 20.00 a bet. The base game pays out prizes for three to five icons, with the star circus dart board being the highest-ranking symbol. Five dart boards pay out 300-times your spin. The other base game icons pay from 20-times to 200-times. 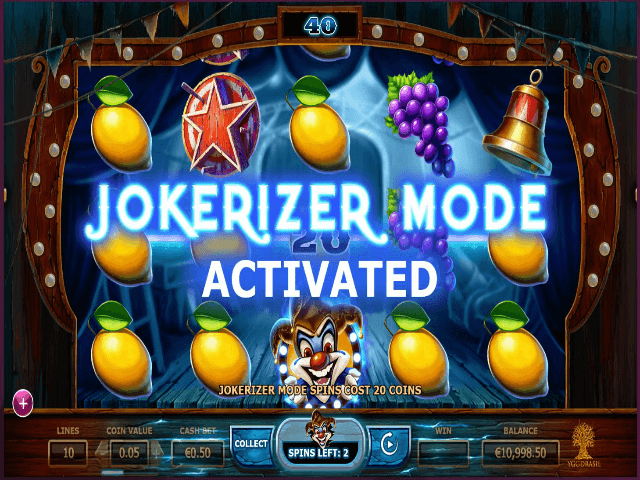 Matching two or more jokers gives you the option to hold them during the rest of the free spins, with 60 coins paid for the privilege. Holding icons can significantly increase your odds of landing four to five jokers and enjoying a jackpot win. If you love playing slots with a dark, creepy (in a good way!) vibe, then the Wicked Circus slot online will be a winner. The Jokerizer mode gives the game a great twist that can be potentially very rewarding, as well as something of a novelty. So buy your ticket for the circus – but don't come running to us if the clown gives you a chill! Share this Wicked Circus Review today! 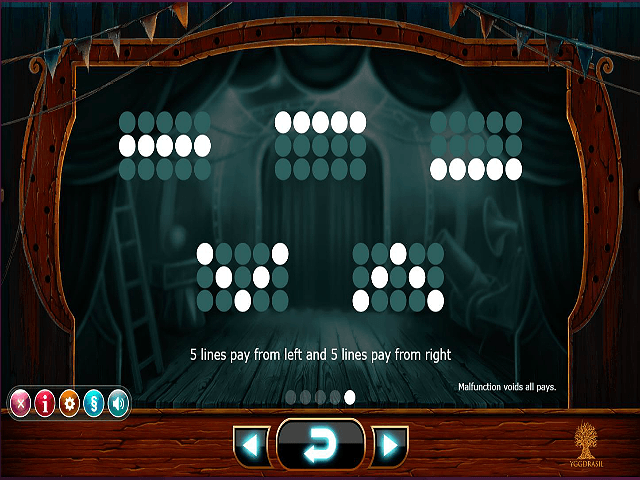 If you like Wicked Circus, you'll love these slot titles too!